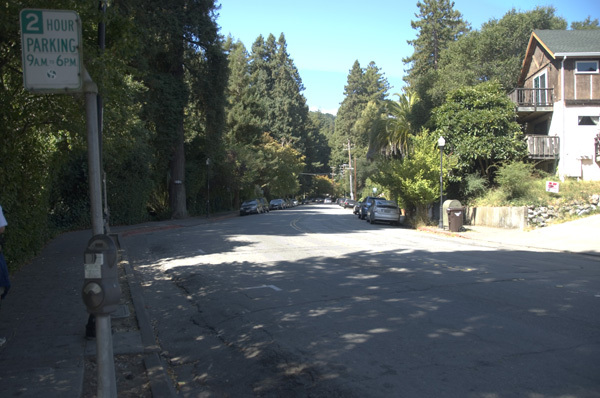 It begins in downtown Mill Valley with a sprint down Throckmorton to the Old Mill Park, then up three flights of stairs as tall as a fifty-story building, and up some more through an old horse ranch to Windy Gap. 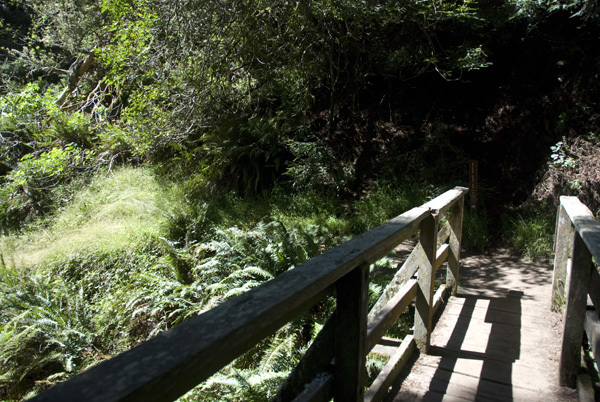 Then it plunges down into Muir Woods across Redwood Creek and begins a tough grind up through the trees over trails named "Dynamite" and "Cardiac." 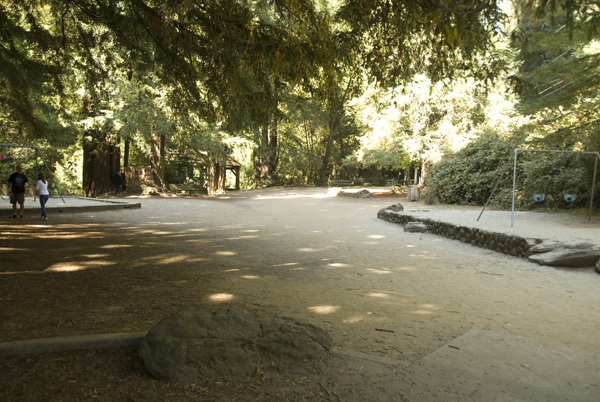 At the top of Cardiac, the course levels out before it plunges down through the "Swoop", over the rocks and roots of "Steep Ravine" and the discouragingly steep climb up "Insult Hill." 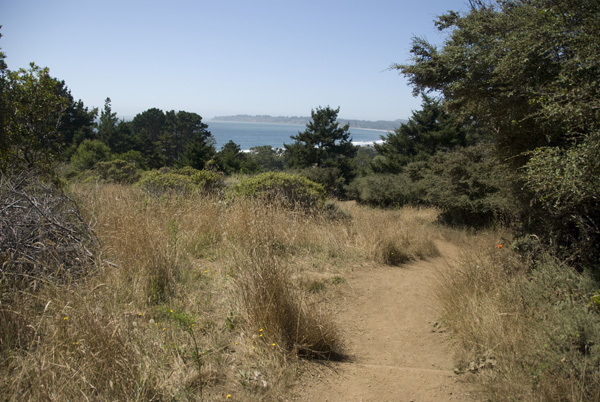 Finally, as the course follows the relatively gentle slope of The Moors toward the ocean, Stinson Beach is in sight a mile ahead. This is where experienced racers resort to secret short cuts and where others racers will sprint the last quarter mile in an effort to move up a couple of places in the final results. 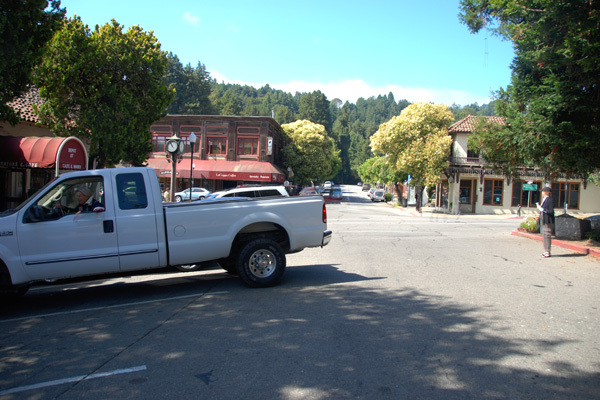 The course begins in front of the Depot Bookstore, on Thockmorton Avenue in Mill Valley. Head west on Throckmorton Avenue. Continue on Throckmorton Avenue until you reach the intersection with Olive Avenue. At the crosswalk, turn left, and run through Old Mill Park.Most runners stay to the left of the restrooms, but some go to the right, to avoid the crowds. Run between the two playground areas. 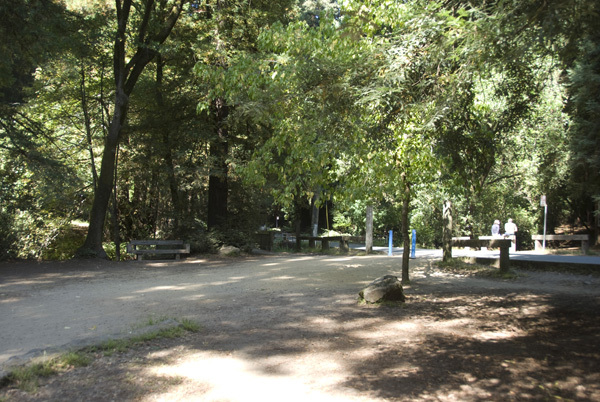 Head toward the road and footbridge toward the rear of the park. 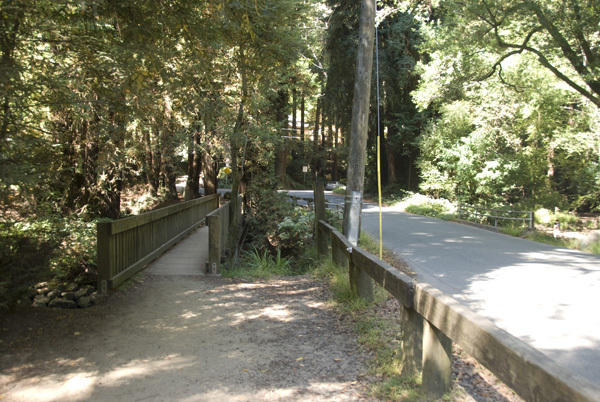 Most runners take the footbridge on the left, but some take the road to avoid congestion. Continue up narrow Cascade Way. Do not use the first stairway on the left. 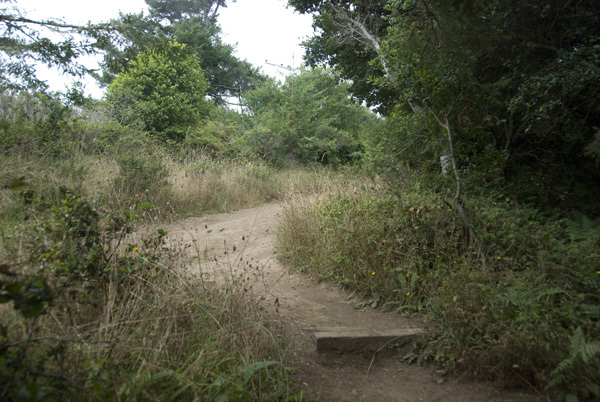 Run (or walk) up the first flight of Dipsea Stairs. 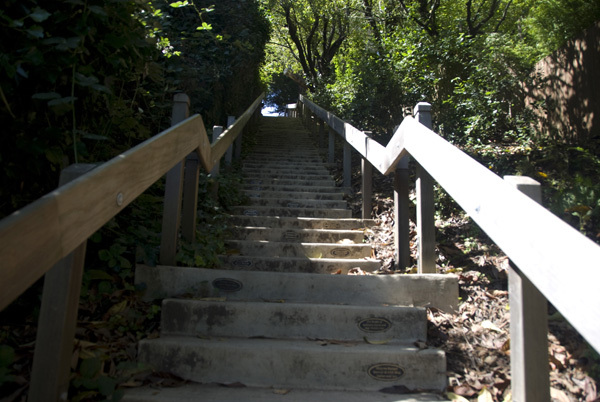 Watch your footing on the topmost steps of this first flight. 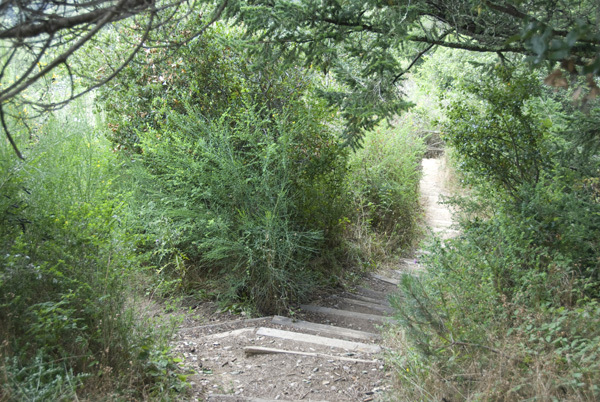 At the top of the stone steps, turn right. 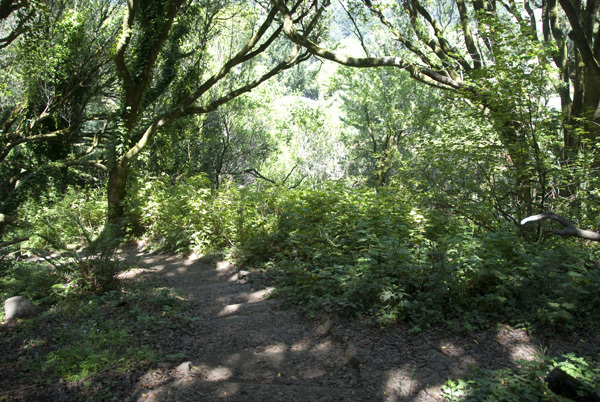 At the top of the stone steps, turn right. 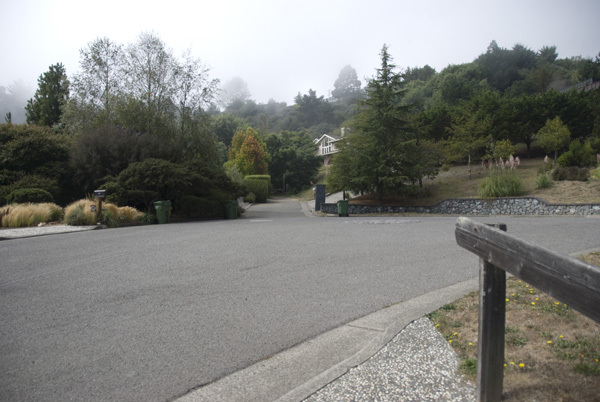 At the intersection of Millside Lane and Marion Ave, make a sharp left turn up the hill. 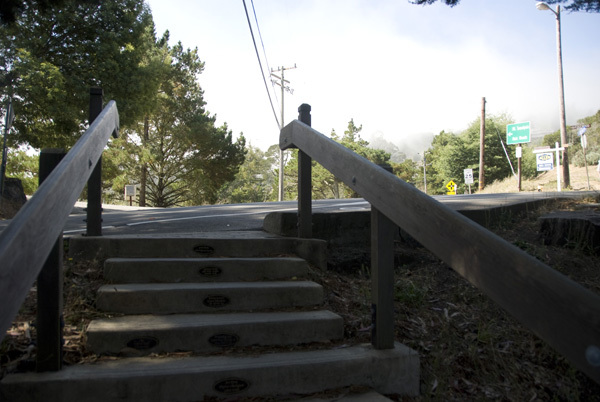 Almost immediately after the turn onto Marion Ave, start climbing the second flight of Dipsea Stairs. Up the second flight... at the top, turn left. At the top of the second flight, turn left onto Hazel Avenue. The third flight will be on the right, in about 100 feet or so. 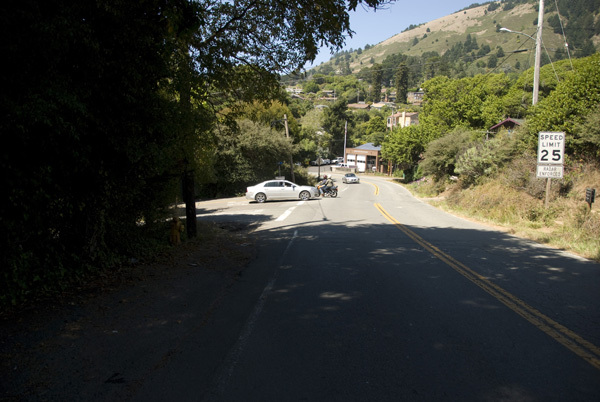 The top of the third flight is at the intersection of Edgewood Avenue and Sequoia Valley Road. Turn right here. 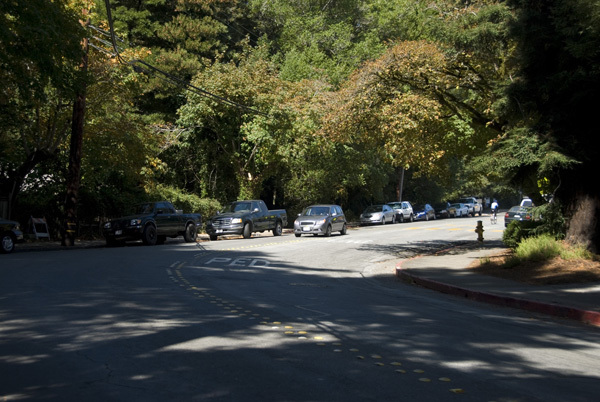 Across the crosswalk, the Dipsea Trail continues on the hill above the roadway. 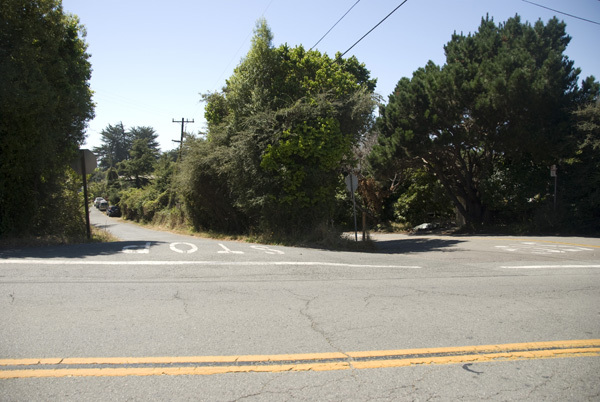 On race day, runners usually run along the road, when there are traffic controls in place. 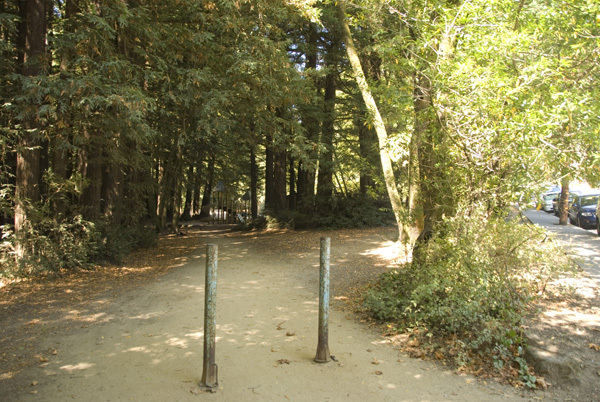 However, it's recommended that runners use the trail at all other times. Veer right up Walsh Drive. 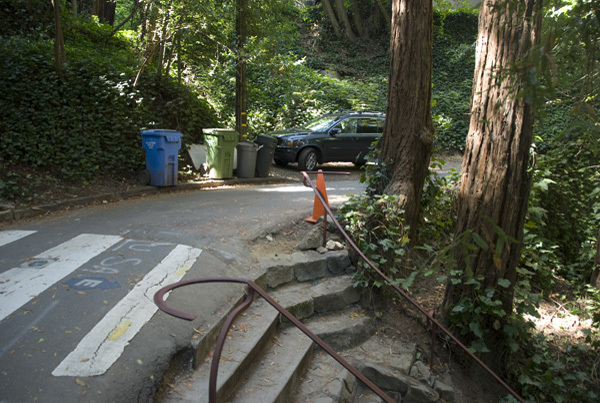 At the cul-de-sac, continue up the narrow driveway ahead of you. 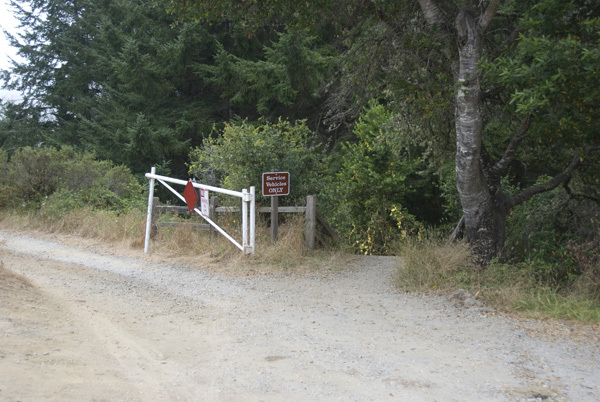 The driveway ends at a wooden gate with a "Dipsea Trail" sign. 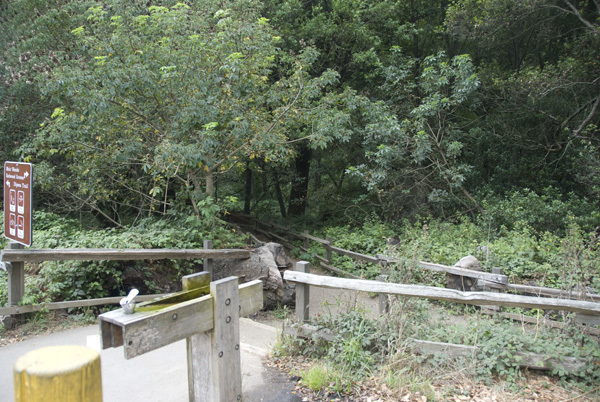 Run around the gate onto the trail. At this point, you've only run a mile. You have quite a way to go. 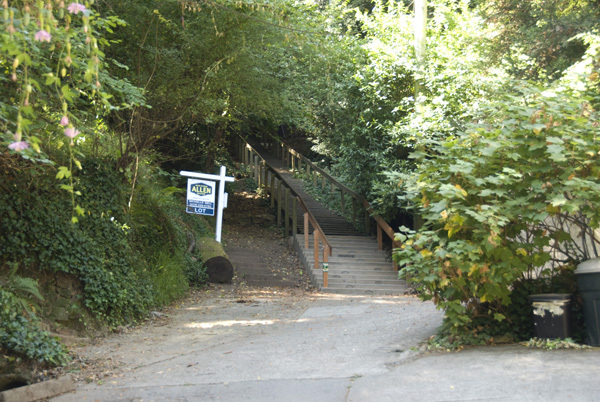 The trail emerges onto Bayview Drive. 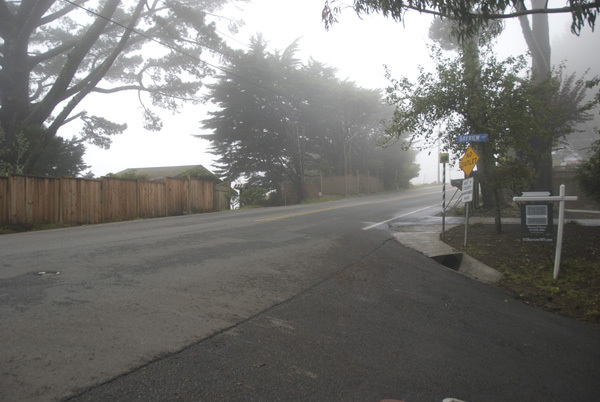 Follow Bayview Drive to Panoramic Highway. 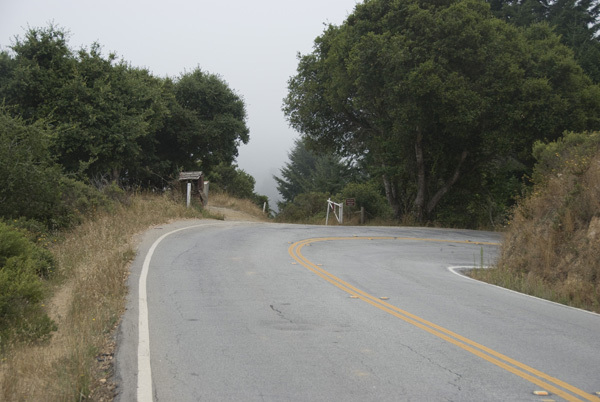 At Panoramic Highway, turn right and cross the road. Be very careful and watch for cars as you cross. 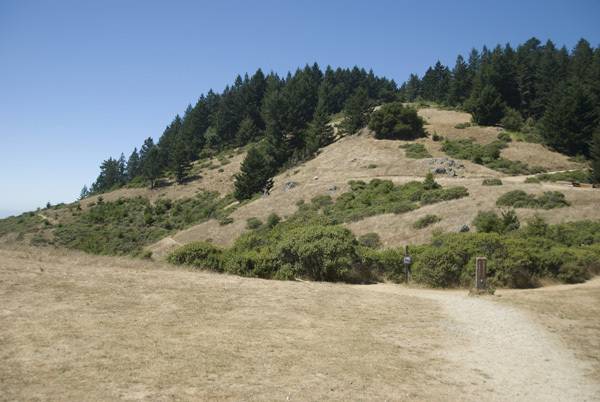 The Dipsea Trailhead is on the left, about 150 feet from Bayview Drive. 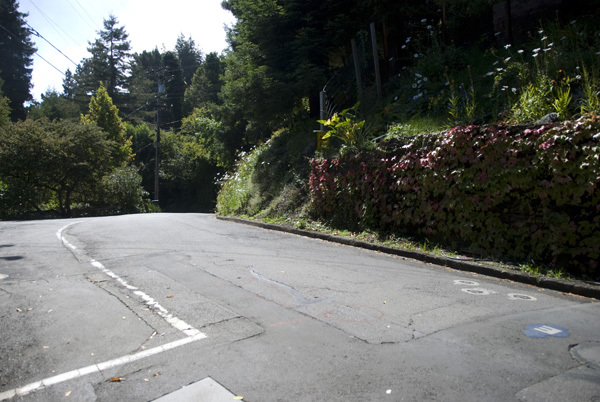 Welcome to your first stretch of downhill. Watch your footing! 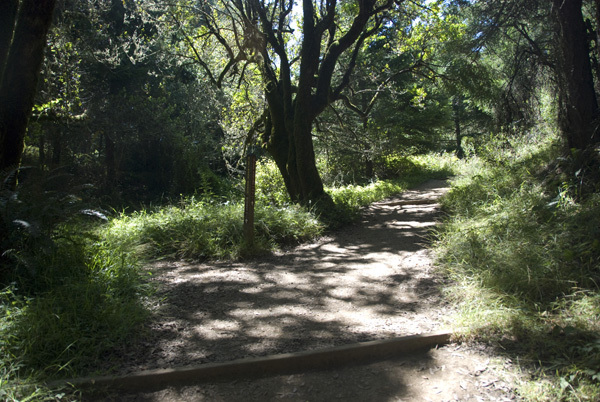 The Sun Trail splits off from the Dipsea Trail here. 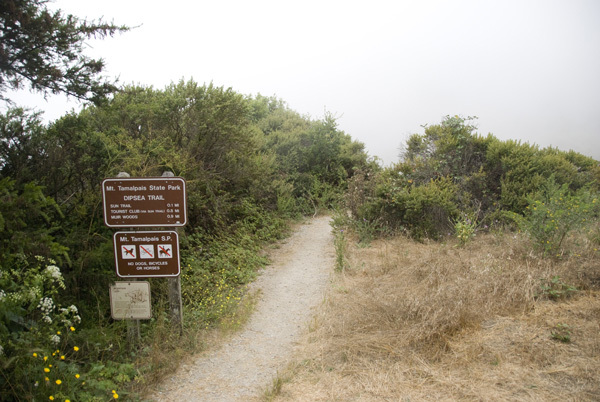 Stay on the Dipsea Trail, to the left. 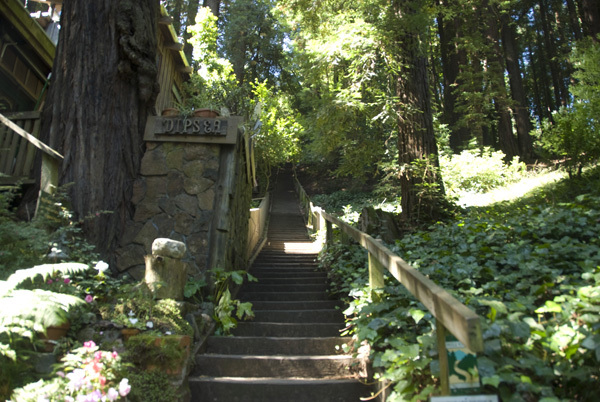 Run down the stairs and onto Muir Woods Road. 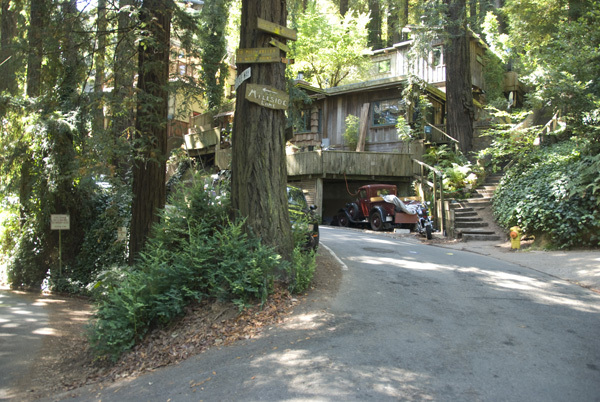 Turn right onto Muir Woods Road. 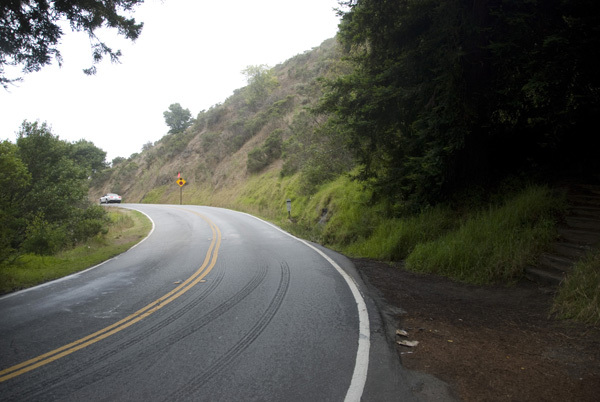 Stay on the left side of the road and be very careful of oncoming cars. 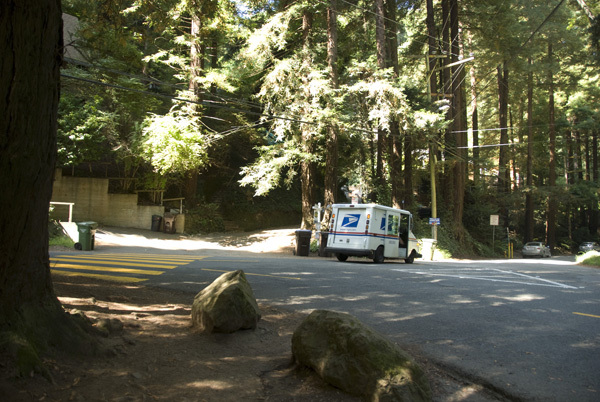 After almost half a mile on Muir Woods Road, look for the driveway and mailboxes on your left. 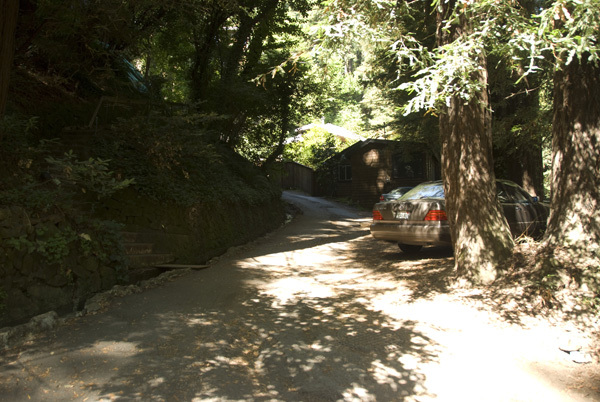 Just to the right of the driveway is the trail. 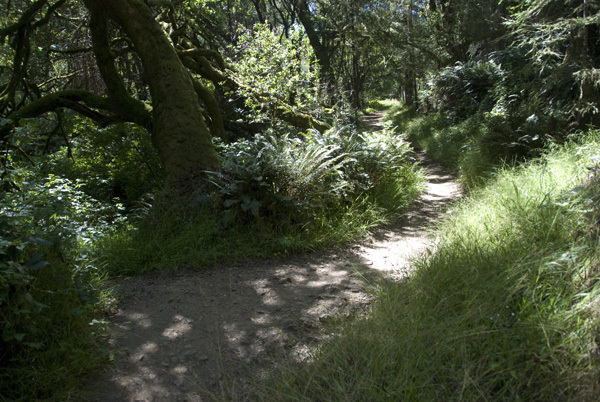 Continue down the trail. You'll pass the Mile 2 marker here. 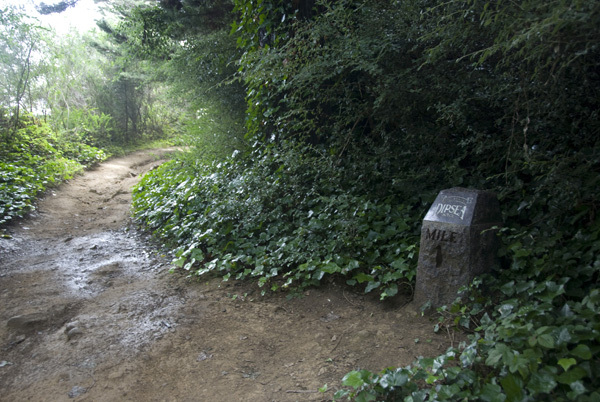 The "Suicide" shortcut rejoins the trail here. Continue to the right. 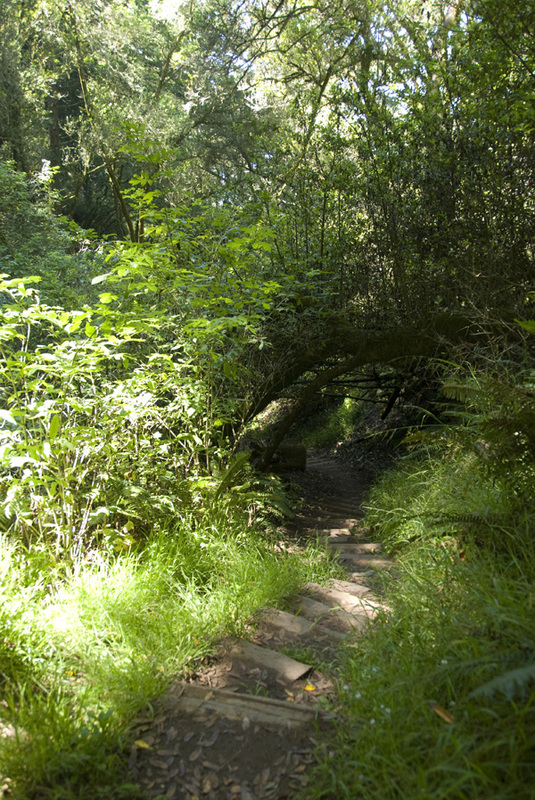 Continue on the trail down to Muir Woods Road. 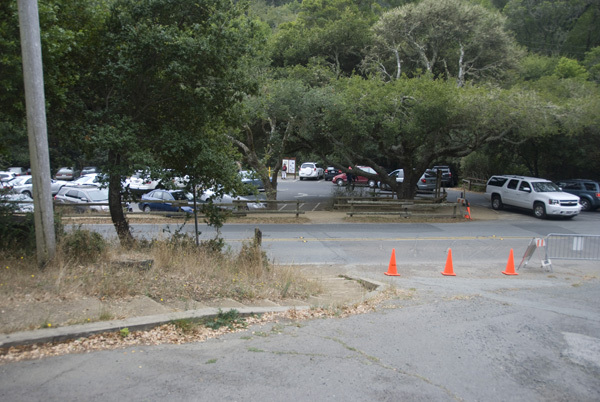 Cross Muir Woods Road (watching for traffic) and run through the parking lot toward the informational sign. Past the drinking fountain, turn left. This is the last water you will encounter before the end; please hydrate wisely. Cross the plank footbridge over the creek. 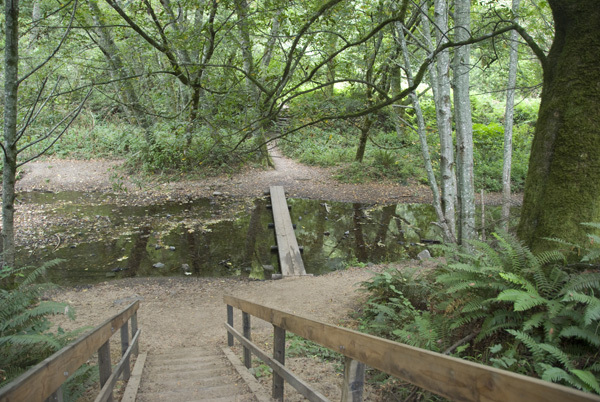 This footbridge is often removed in the winter and spring; you may need to take a detour at those times. This section, called "Dynamite", has a lot of switchbacks and a lot of climbing. 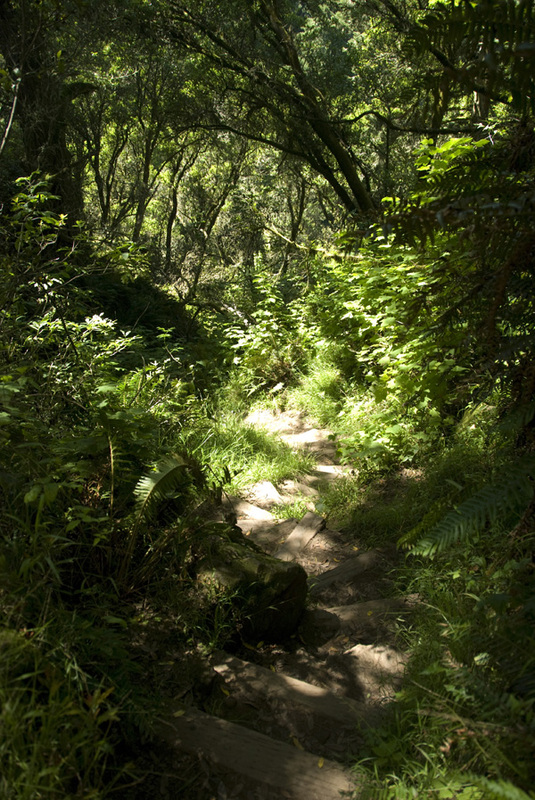 But by taking it slow, you can at least enjoy the lush landscape. 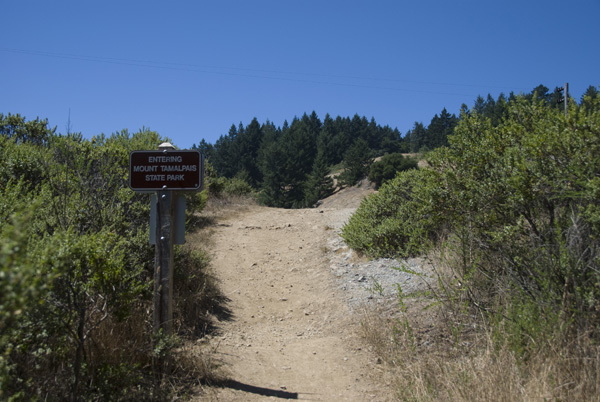 After quite a bit of climbing, you will reach the fire road. 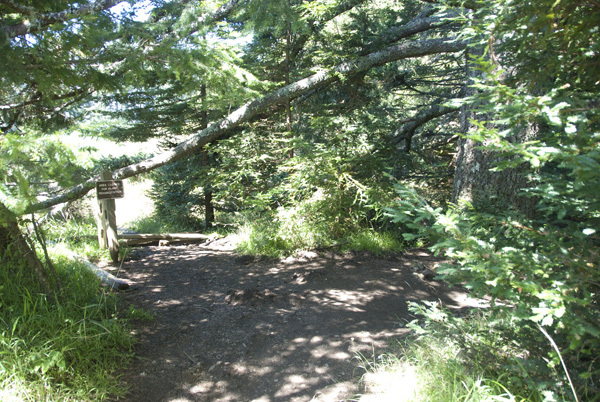 The trail continues to the right and is generally the most direct route. 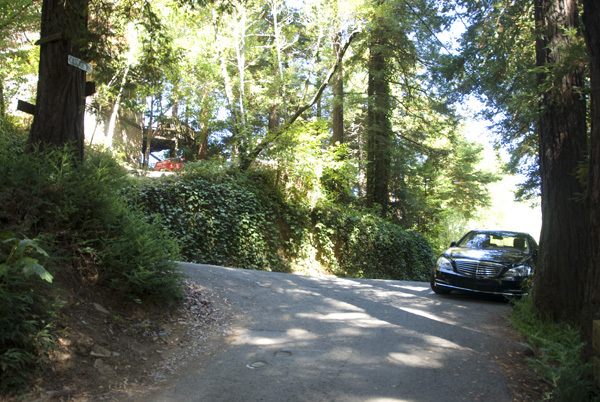 However, on race day, some take the fire road for better passing. 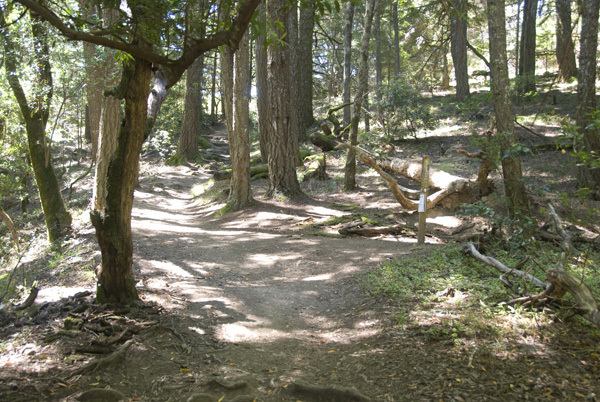 The trail rejoins the fire road. Turn right, onto the fire road. 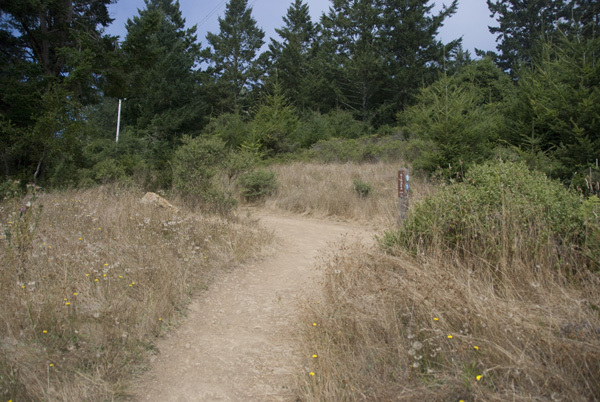 The trail again splits off to the left from the fire road. 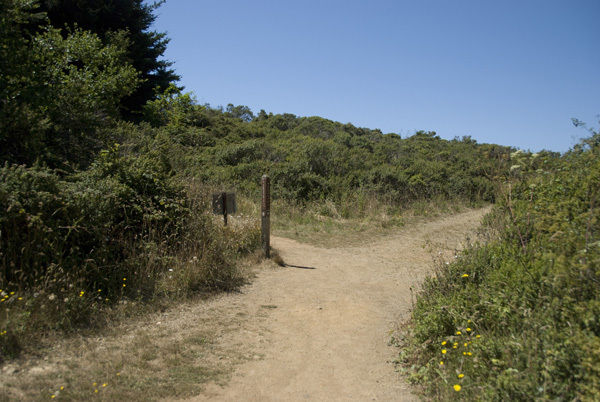 As before, you can take either route, but the trail is more direct. 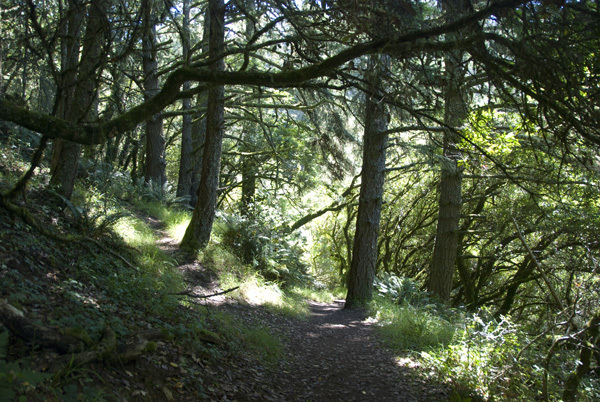 The trail rejoins the fire road, again. The 3-mile marker is at this intersection. 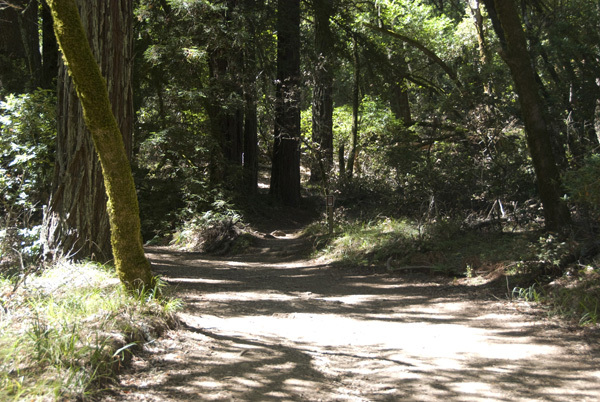 Turn left, onto the fire road. 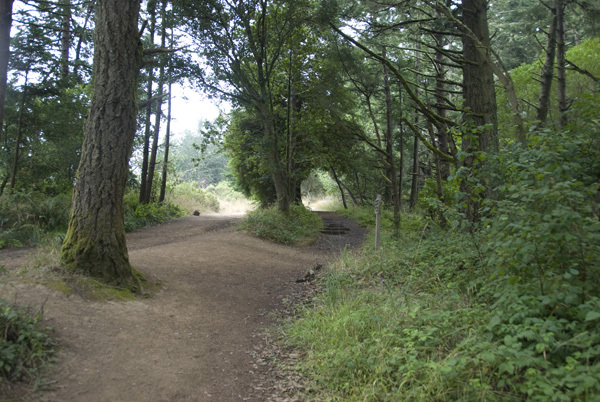 The trail splits off, to the right. 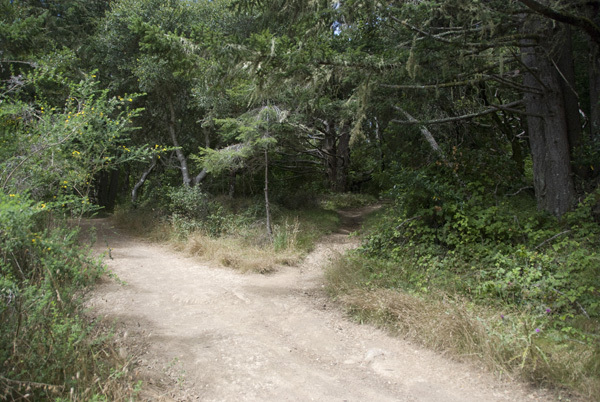 Again, both routes will get you there, but the trail is more direct. 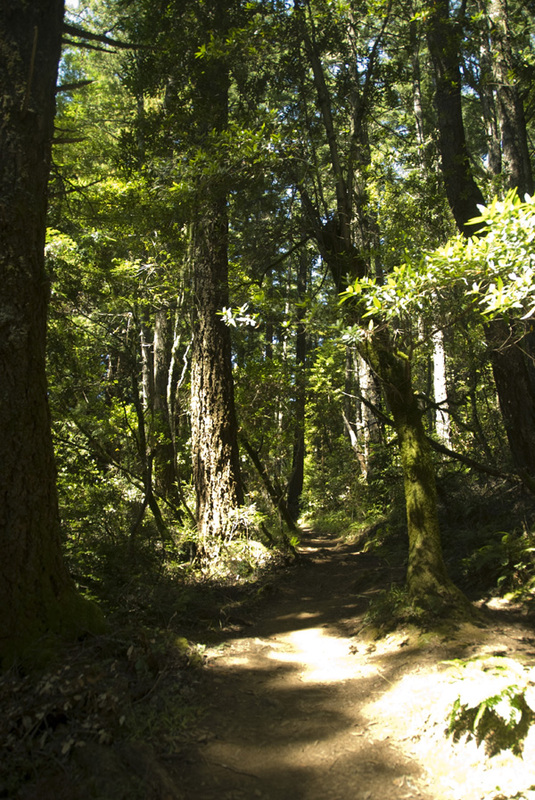 The trail meets up with the fire road again. 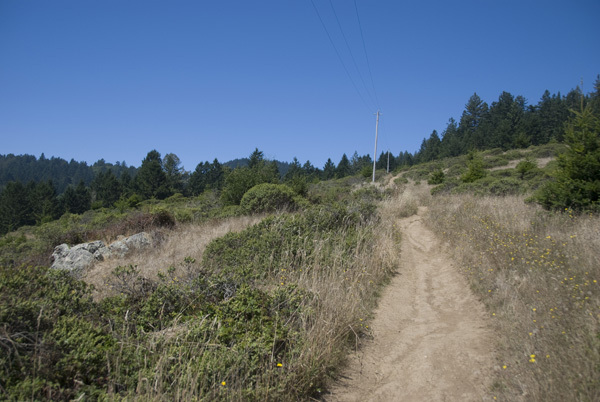 Run across the fire road to continue on the trail. 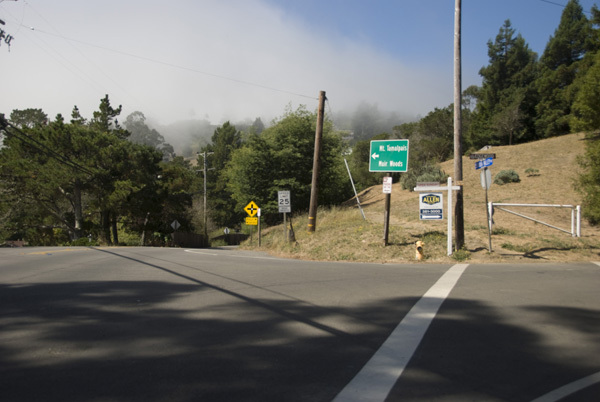 Soon after that last intersection, you will pass "Halfway Rock"... it's not quite the halfway point, but since most of what's left is downhill, you're roughly halfway done, timewise. Continue through the section dubbed "The Rainforest". 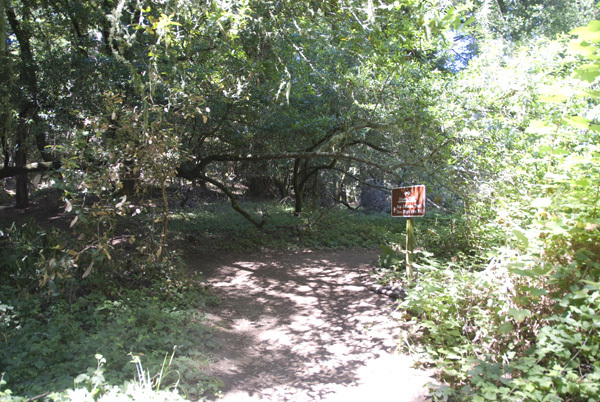 At the intersection with the Ben Johnson Trail, stay to the left to continue on the Dipsea Trail. 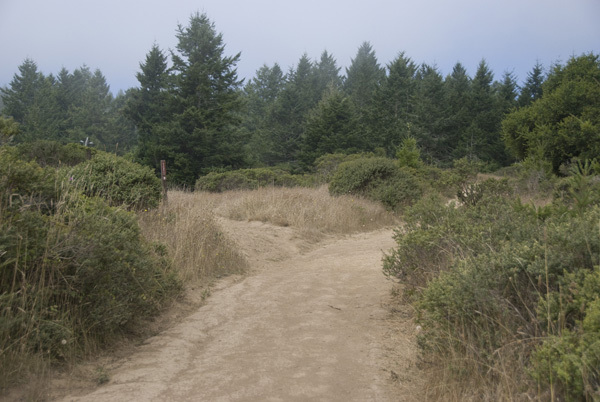 Again, you will reach the fire road. Turn left. 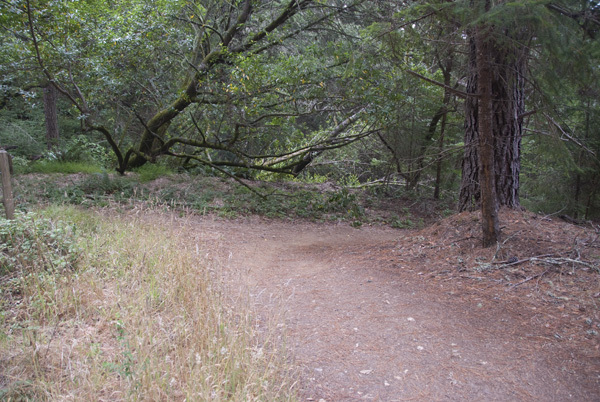 At the intersection with the TCC Trail, continue straight on the Dipsea Trail. 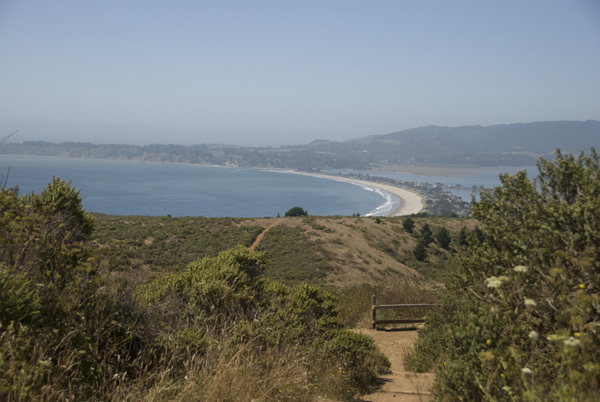 Continue straight on the Dipsea Trail, where you encounter an unusual stretch of flat trail. 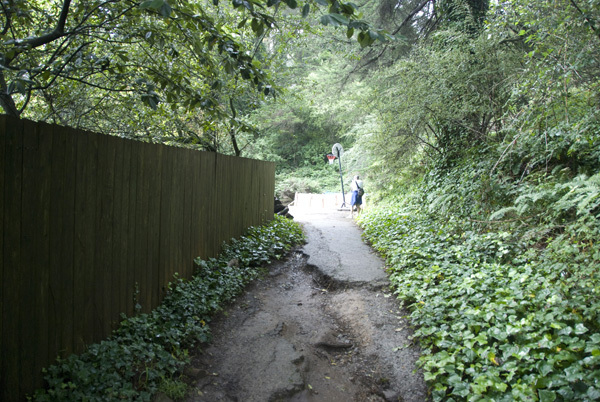 Another Dipsea shortcut, "The Swoop," is to the left here. 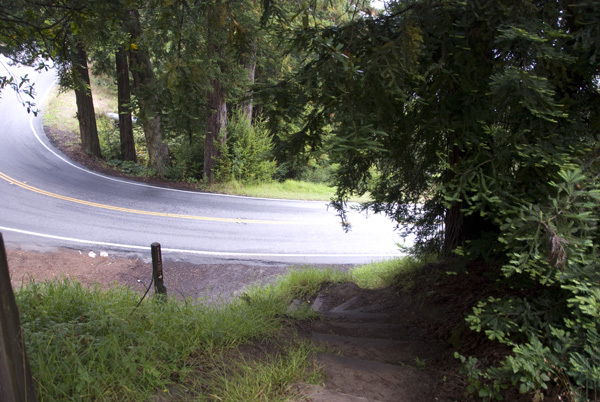 The Swoop is a steep, treacherous downhill that is off-limits except on race day. 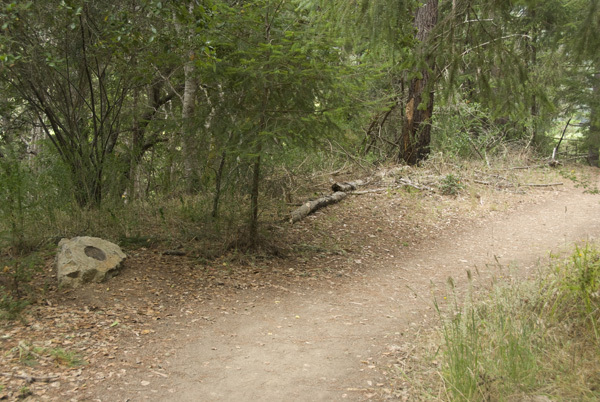 If signs indicate that the shortcut is off-limits, stay on the official trail to the right. 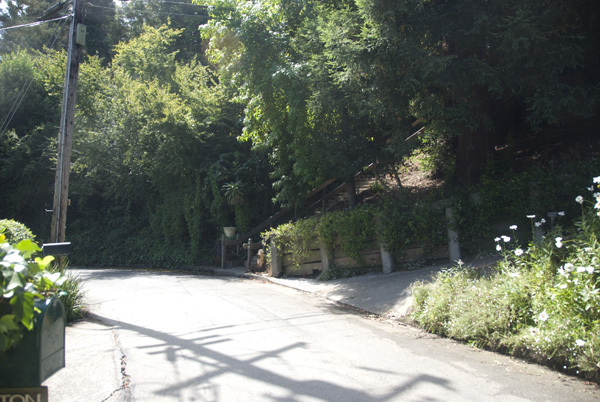 Watch your step and watch your head in Steep Ravine. 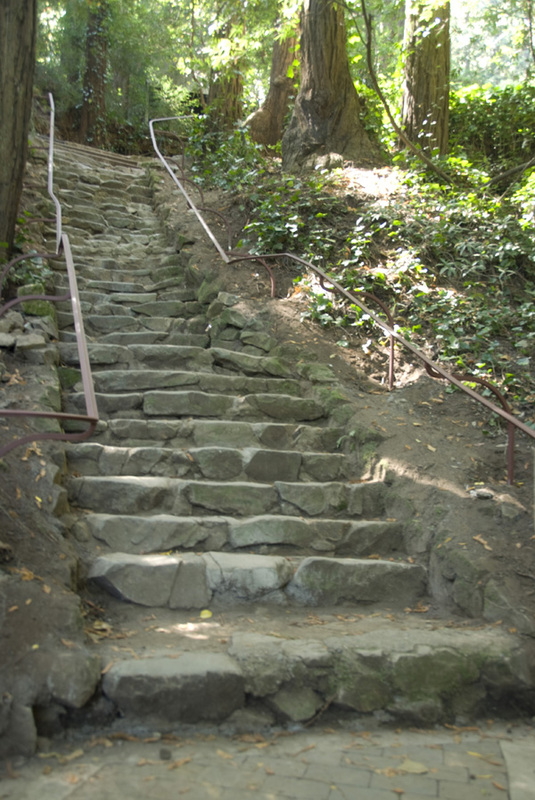 These steep steps in Steep Ravine need to be taken carefully; many injuries occur here on race day. 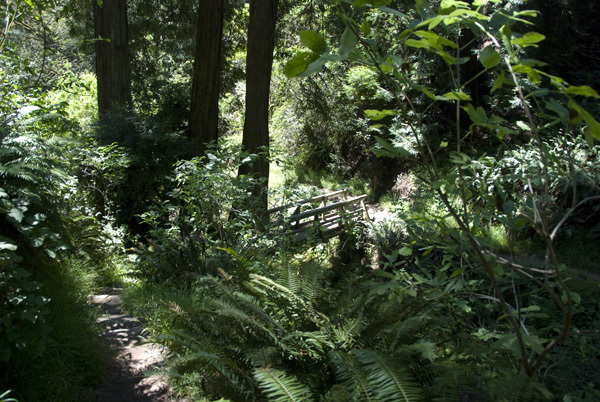 After descending hundreds of stairs in beautiful Steep Ravine, you will reach a footbridge at Mile 6. After crossing the footbridge, turn left. 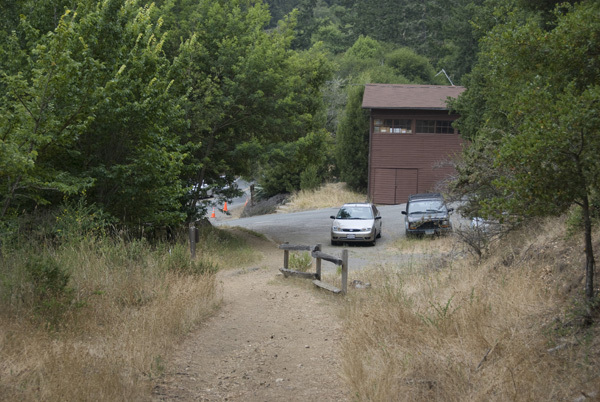 Stay on the Dipsea Trail, to the right, up the hill. This is the beginning of "Insult Hill".... and you thought you were done with uphills? 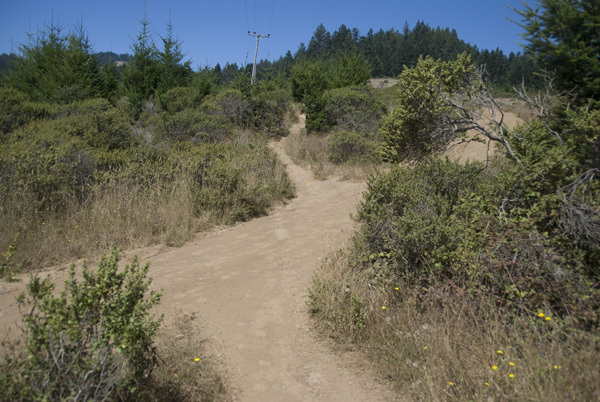 Stay on the Dipsea Trail, to the right, up the hill. Cross the fire road to stay on the trail. 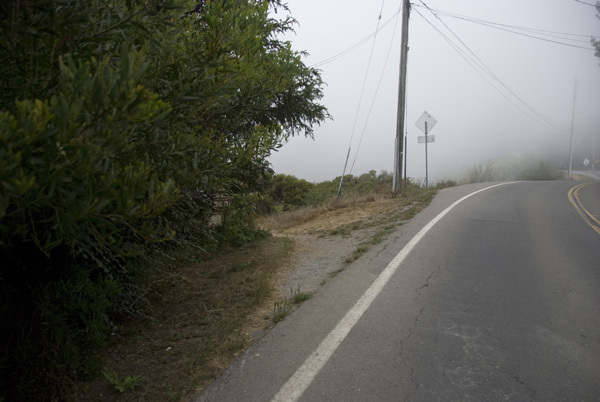 On race day, many turn to the right to take what are known as the "Panoramic Shortcuts". These shortcuts are not shown in this guide, and can be difficult to find. They're not recommended unless you have someone to follow. 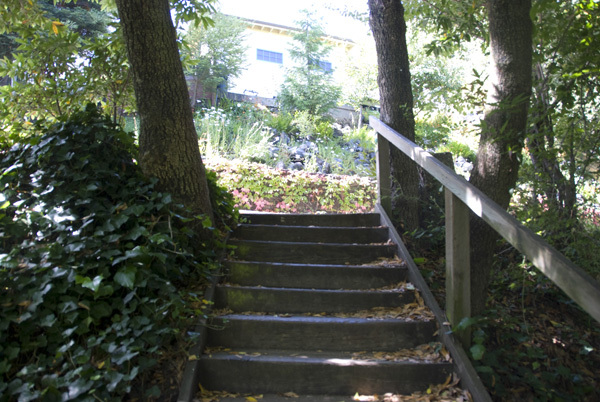 Continue down the steps. 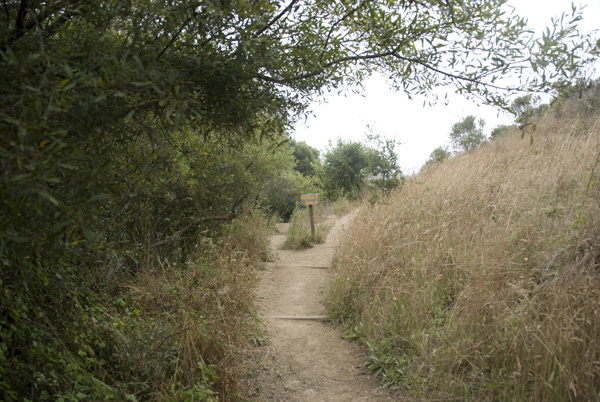 The Panoramic Shortcuts rejoin the trail here. When it's not race day, the trail continues here. 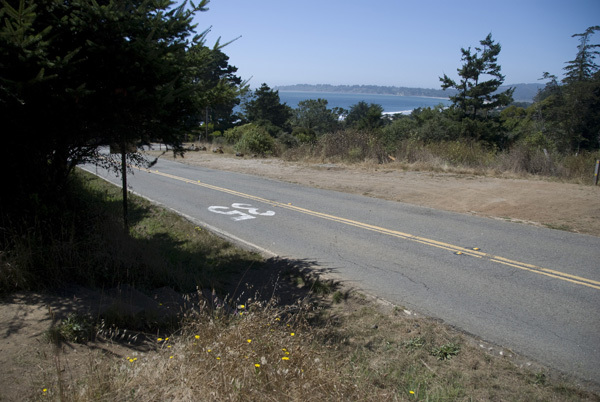 During the race, all runners turn to the left, through the grass, toward Shoreline Highway. 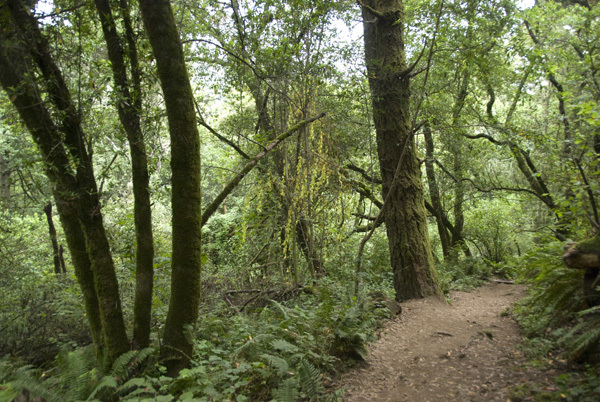 When it's not race day, staying on the trail is recommended. 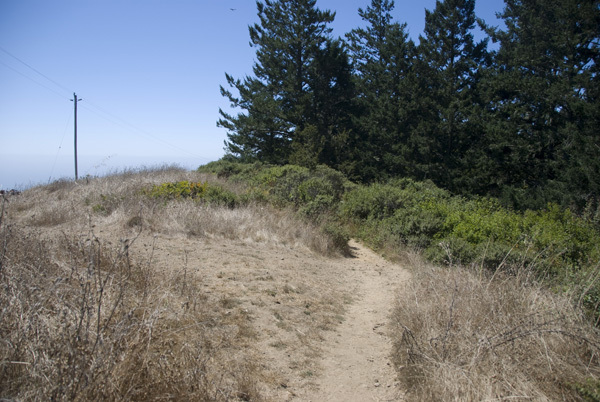 The trail crosses Panoramic Highway. Watch for cars when crossing. 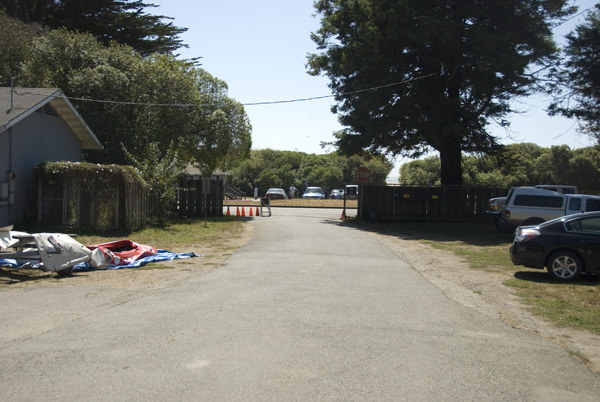 This is the view on Shoreline Highway if you cut through the grass directly to the road. 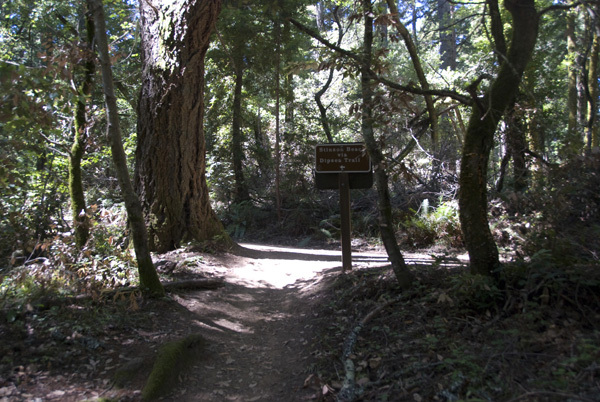 If you followed the trail, the trailhead is on the right side of the photo. The race course is on the first left turn (which is also where this guide directs you). 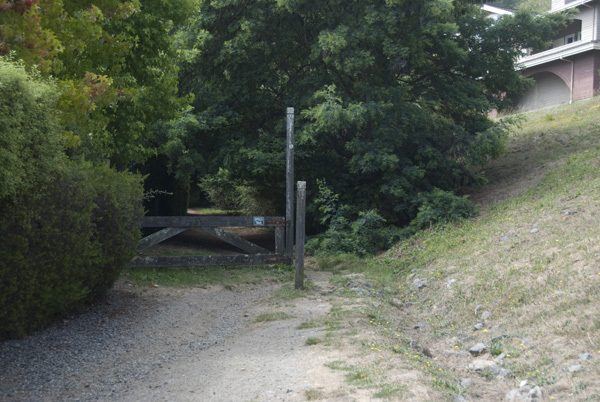 However, it is on a private road that is often gated. Instead, take the second left turn, immediately after the first, onto Arenal Avenue, to reach the beach. 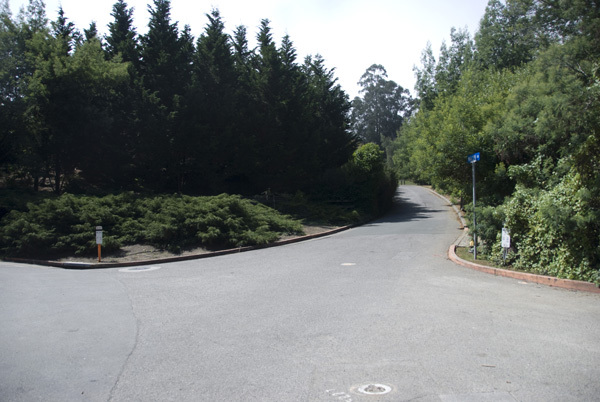 The view of the private road (on the left) and Arenal Avenue (on the right) as seen from the Dipsea trailhead at Shoreline Highway. Be very careful of cars as you cross Shoreline Highway. 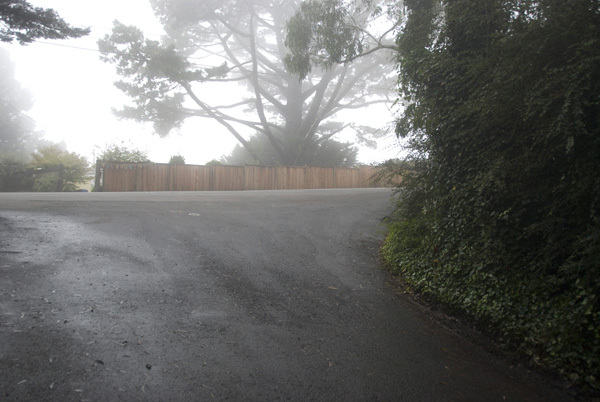 If you're on the private road, you'll turn left right after the gate. 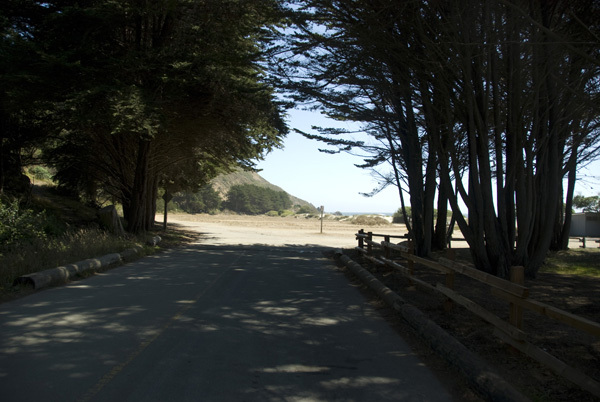 The final stretch, once you hit the Stinson Beach parking lot. Run around this gate if it's locked. And right here is the finish line! 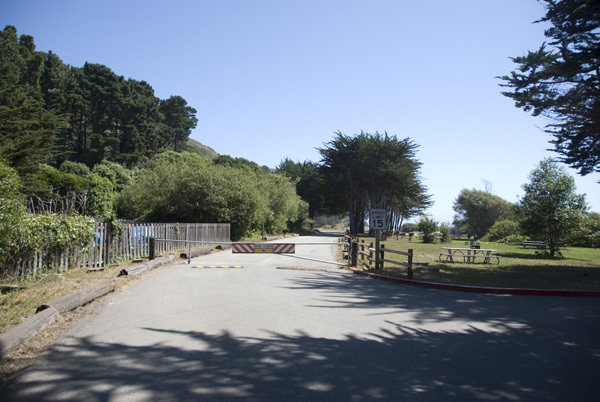 Congratulations, you've completed the Dipsea!